Two college students on their week at the world's biggest marketing festival in the South of France. "Millennials are not the next generation; they are the now generation," said the founder of Ipsos Girls’ Lounge, Shelley Zalis. This quote clearly depicts the atmosphere the Cannes Lions International Festival of Creativity presents to all who attend this prestigious event. With the rising themes of virtual reality, gender equality, and creativity in the future, the Palais buzzed with conversation about the up-and-coming. We, as two of 57 University of Georgia students, had the unique opportunity to attend Cannes Lions while studying advertising and other communications-related majors. While running from seminars to sponsored cabanas, there has been no shortage of networking. We have encountered creative directors from Sweden, world-renowned magicians, partners at advertising agencies, and everything in between. While most students are working summer jobs or taking classes, we had the chance to meet the biggest names in our industry while enjoying life on the French Riviera. We were given freedom to roam all throughout the festival while sharpening our professional communication skills and gaining global perspectives. We ventured outside the classroom setting and were able to experience the creative industry firsthand. Personally, as American women, we have thoroughly enjoyed the seminars on the topics of gender equality and diversity in the workplace. We were surprised to learn that women are underrepresented in the mass communications industry, considering the majority of our journalism students are female. There are several organizations taking a stand against the gender gap and the sexualization of women, such as #WomenNotObjects and the Girls’ Lounge. While these seminars and others were incredible, the real highlight for us was networking with international professionals. As much as we were excited to speak with professionals from companies such as Edelman and Saatchi & Saatchi, they were equally as interested to hear about our perspectives as students. 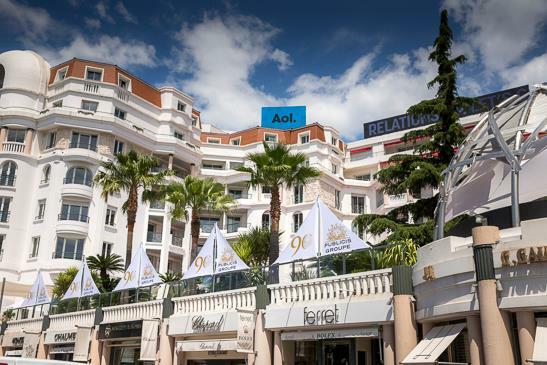 We have compiled some tips for future students lucky enough to attend the Cannes Lions. Take advantage of all the opportunities the festival presents. You never know who you’ll meet, and everyone wants to meet you just as much as you want to meet them. Venture outside your comfort zone. Traveling in a pair is much easier than traveling in a large group. The most interesting seminars we attended were the ones we stumbled into by chance. Yes, there is an abundance of rosé, but you don’t need it all. Start your day early in the morning, and do not leave until you have a good story to tell about your day. Don’t overwork your body. There are events happening seven nights in a row until 2 a.m. We promise missing a couple of late nights will do your mind and body some good. This week will be one of the best experiences of your entire life. Enjoy it while it lasts and make the most of every day. We have learned not to limit ourselves because the options are endless, as cliché as that sounds. We’ve never felt more empowered to pursue the impossible after just a few days immersed in a world of creatives. Shelby Gordon is pursuing a degree in public relations with a communication studies minor at the University of Georgia at Athens, Georgia. She will be graduating in fall 2016. Shivani Patel is pursuing a dual degree in public relations and linguistics with a Spanish minor at the University of Georgia at Athens, Georgia. She will be graduating in fall 2016.